Keyboards are a terrific example of how bad design can get stuck in a rut and unable to overcome inertia. Everyone says dvorak keyboards are far superior to qwerty, yet even after 25 years of dvorak, qwery is still king because its use is so ingrained. 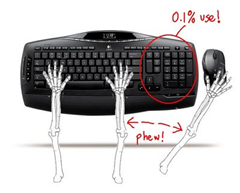 But another aspect of keyboard design that has me really grumpy is the numeric keypad appendage on desktop keyboards. It is a holdover from the days when users were “data entry clerks.” But we are stuck with this design, and it has started to annoy me lately because I’ve been switching between a laptop during the day and a desktop at night. Working with a desktop keyboard after using my laptop is strange and difficult. After some reflection, I realized the problem. My right-hand is used to shifting all the time between jkl; and the mouse. On the laptop, this is a subtle and effortless gesture. On the desktop, it’s like playing table tennis.